Hello, little man. I will destroy you. .. is a gap that perhaps needs to be filled, as a few people here seem to have expressed interest in this divisive figure. "I don't at all mind actively disliking a piece of contemporary music, but in order to feel happy about it I must consciously understand why I dislike it. Otherwise it remains in my mind as unfinished business." Oh but he has been mentioned long, long ago, when I tried to arouse interest in his Reigen and Mädchen mit den Schwefelhölzern - might have the title of the last one incorrect - you know what mean. Saw at Wergo a documentary DVD about and with him, wanted it, but thought twice when I checked the conversion table Euro to US Dollar! If the Ardetti will be available in the US, I most certainly will buy it. Thank you for the heads up! Das Mädchen mit den Schwefelhölzern. As good as Lachenmann gets, which means that it's as good an opera as it gets. I've had trouble getting on with this composer. A lot of his music seems to consist of nothing but shuffling, scraping and squeaking, as if a few people were moving furniture around, and I'm speaking as someone who loves Stockhausen's Momente and early Penderecki. The only CD I actually own is the ECM recording of Mädchen mit den Schwefelhölzern - I've copied that from Uffeviking, so blame any typos on him . That does have its moments, so perhaps if I give it a few more goes, it'll all click into place. But I tend to get a "handle" on most music fairly quickly, even if I don't understand it entirely at first, and I think, with Lachenmann, I may have found one of my deaf spots. I'm actually quite disappointed in myself. I thought I could cope with anything, that no composer was too strange or challenging for someone who spent his teenage years listening to Stockhausen, Ligeti, Nono and Penderecki. But I've failed Lachenmann. Last year a couple of guitarists here did Salut für Caudwell (1977), Lachenmann's "deconstruction of flamenco technique." Basically the musicians tap, stroke, strum and scrape the instruments, in very defined rhythmic patterns. Then I heard Pierre-Laurent Aimard in Guero (1970), a short work in which the pianist is supposed to scrape the keys with his fingernails. (Aimard used a credit card.) There's no denying that the composer deliberately exploited the piano for many of its "non-pianistic" elements, and of course you would never want to listen to this piece if you were in the mood for say, Brahms. But in all of these cases, I found myself thinking about the performances for days afterward, and that's worth pondering. "Do you realize that we're meteorites; almost as soon as we're born, we have to disappear?" cool, looks like another possibly fun CD. 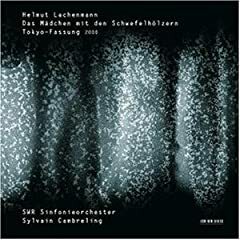 i have 2 Lachenmann CDs..... piano music on one, and my favorite of his, Mouvement and a few others on the other. Not anything I'd listen to consistently, but good stuff if you feel bored with what you've been listening to at the moment. I heard the Arditti play Lachenmann's latest string quartet in Wrocław last spring. Wow. So I know I'll be buying this CD. Good news, indeed! I can't imagine any performance of Gran Torso being more perfect than the Berner Streichquartett's (coupled with Salut für Caudwell on col legno), but if anyone can do it, it's the Arditti. I was. No reason for a thread not to have a double meaning. One thing that has intrigued me about much of Lachenmann's more recent music (specifically, all the orchestral works since Tanszsuite mit Deutschlandlied) is how intimately they're connected with the German symphonic tradition: for me Ausklang is inconceivable without the piano concertos of Brahms; NUN without Bruckner's adagios; Staub without Beethoven's 9th. They may not sound anything like the three Bs, but the heart that beats underneath the Marxist deconstruction is German, and Romantic in spirit. I got into Lachenmann, when I asked my composition teacher, what I should try, if I wanted something that is hard to listen to. I heard the Mädchen mit den Schwefelhölzern. What a fantastic and terrifying work! I don´t recall many composers, who writes something that extremely dark. I never forget theise evil knock sounds near the end! FWIW, the ECM version is probably the one to have (I only have the Kairos) as it's the revised, tightened-up version of the opera, with some of the more flaccid sections trimmed and the ...zwei Gefuhle... passage truncated by about one half. I've not heard the ECM, but the description I've read of the revisions sound like they would improve the opera significantly. I have the ECM recording. In an article about the ECM label (I can't remember where or when I read it - sorry, I'm useless), one writer claimed that although the ECM version was beautifully recorded, the Kairos version offered the more visceral and perhaps more authentic performance. I've got a few ECM recordings of Part and Kurtag, and I sort of get the impression that no matter how seductive and atmospheric the recordings are, they sound slightly fuzzy and reverberant. Even though I liked Lachenmann immediately, when that opera came out I still hesitated. Funny things happen to people when they write operas, I feared. Baseless fear, in this case. 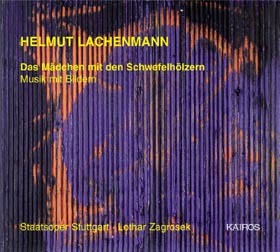 You know instantly that this is not only echt Lachenmann, it's very good Lachenmann as well. Coming from me, that's probably valueless: I can't think of anything of his I wouldn't recommend. Maybe some of the piano stuff. For someone so adept at getting interesting new sounds out of old-timey instruments, his piano music is surprisingly old sounding as well. "Old" here meaning 1930-50ish. Or do I just need to play that disc again? The only piano work I've heard is Guero, which I mentioned above. Are the others similar? and a few others, one early one being totally Darmstadt style, the others experimental, but i think Guero is pretty unique, actually. Oh thanks, that is fantastic! (Love seeing the audience reactions...a few look like they've been hit with a brick.) Wolfgang Behrens's playing is really compelling, even with the not-perfect video. Would love to hear that live...maybe Aimard will program it on one of his concerts. Yes, there's nothing else in his piano output that's quite like Guero. Probably the closest to it in his career is the solo cello piece Pression, which uses pretty much any possible technique to produce sounds on a cello. Variations on a Theme by Schubert: student piece, think Lutoslawski's Paganini Variations, only for one piano. Echo Andante and Wiegenmusik: Darmstadt party-line pieces; not particularly exciting to me. Serynade: mostly a study in piano resonance and the use of the third pedal on a Steinway. Thanks for all that, edward. How long is the whole piece, or suite, or whatever? It's seven pieces totalling about 20 minutes. Don't be too jealous, but I've seen Lachenmann play it live. There are a few recordings available, including a great cpo disc that includes it with Allegro sostenuto; Pression and Dal niente. I hope it's still in print. Page created in 0.064 seconds with 30 queries.